Yesterday, we lost Muhammad Ali, the Greatest of All Time. Note the absence of a noun in that title. He was not the Greatest Boxer of All Time; he was not the Greatest Athlete of All Time; he was not the Greatest Showman of All Time. No, Greatest stood alone, floating, butterfly-like, unencumbered by a noun or any other superfluous impediment that might weigh it down. How do you memorialize an icon whose very existence defied description? To speak only about his prowess in the ring would surely be inadequate, and yet it is essential. He was, of course, a tremendously skilled fighter. As a young fighter, an Olympic gold medalist, a world champion at the age of 22, his reflexes were among the quickest the sport had ever seen. He was a phantom who seemed to evaporate before your eyes when some unfortunate punch was aimed in his direction, only to reanimate himself a moment later, inches away from the intended target. He was ethereal, and yet he possessed substance: the young champion didn’t just win by making his opponents miss, he made them pay. He broke them down. He knocked them out or made them beg for mercy. Cassius Clay vs. Sonny Liston, 1964. Watch the entire fight here; photo via Getty. After Ali endured a lengthy suspension from boxing for his conscientious objection to the Vietnam War, however, he returned to the ring and found that those once-famous reflexes had dulled, and that punches which once seemed to miss him by a hair’s breadth were now reaching their mark. But, rather than diminish Ali, it was this new iteration that elevated him to an even more celebrated plane of existence: the plane of the supernatural. In fiction, from the Native American legend of the Wendigo through the fairy tales of the Brothers Grimm to Hannibal Lecter, there exists a fantasy that one man may absorb the strength of another by consuming him. But it took Muhammad Ali—surely a character too fantastic for any work of fiction—to make this power manifest in reality. In his now legendary Rumble in the Jungle against George Foreman, Ali invented a strategy so counter-intuitive that it cannot help but boggle one’s mind even 40 years after the fact: Ali let Foreman hit him. He leaned on the ropes and allowed Big George, quite possibly the hardest puncher in the history of the sport, to unleash all of his fury upon him. It was, by any human measure, a recipe for suicide. Except that for Ali, it was not. As the fight wore on, it was Foreman who seemed to wilt with each heavy blow he landed. And Ali? Ali grew stronger, bolder, more energized. As Foreman deteriorated before our disbelieving eyes, Ali became greater. In the end, it’s hard to say whether Ali eventually knocked Foreman out, or consumed what remained of his soul. Of course, the same invincible chin that allowed Ali to absorb Foreman’s power would be his eventual undoing. It was that chin that allowed him to continue to stand through 14 of the most brutal rounds ever witnessed in the Thrilla in Manila, against his nemesis, Joe Frazier, a night that forever ruined both men. It was that chin that allowed him to convince people that he was fit to continue to fight into his late 30s, even after doctors found a hole in the outer layer of his brain, even after his speech began to run together, and even after his hands began to tremble noticeably. It was that chin that forced his corner to stop the godforsaken fight against his former sparring partner, Larry Holmes—the only time in his career that Ali would be stopped—because he would not quit even when every ounce of strength had long since deserted his decaying body. If we’re telling the truth, for all his accomplishments in the ring, Ali was not the greatest boxer of all time. He may not have even been the greatest heavyweight champion of all time. He was among the greatest by any measure, but in terms of sheer ability and accomplishment, his record lags behind Sugar Ray Robinson, Jack Johnson, Joe Louis, and Henry Armstrong, as well, as, perhaps, others. But this apparent shortcoming doesn’t diminish his accomplishments in any way; in fact, it only enhances them. It only serves to underscore why he was the Greatest. Could you pick Sugar Ray Robinson, Jack Johnson, Joe Louis, or Henry Armstrong out of a lineup? Could you recite a healthy chunk of their life story from memory? Could you rattle a dozen of their most famous quotes off the top of your head? You could for Ali. Everyone can for Ali. Why is that? Why did he become something so much bigger than the sport that introduced him to the world? Of course, his gift of gab was legendary, but so it was for many athletes. And, certainly, he was the right figure for his time: an outspoken voice in the fight for civil rights at a time when a critical mass had emerged against the status quo, a voice for peace in an era choking with war and nuclear brinkmanship, and a television-friendly face at a time when television was reaching its saturation point around the globe. But even adding up all of his tangible qualities, which were unquestionably immense, Ali was still something significantly more than the sum of his parts. He was a force of nature. What made him so powerful? What made him the most recognizable figure sports has ever had and likely will ever know? What made him quite possibly the most popular human being on the planet? I believe it was his humanity. Ali, for all his success, for all his talent, for all his gifts, whether god-given or earned through hard work, was tangibly, visibly, empirically human. In the ring, he was not an invincible Goliath, like Foreman or Sonny Liston might have seemed seemed before they met him. His body was fit but unremarkable. He didn’t have one-punch knockout power. He could be hit, and he bled and wobbled when he was. Ali was not perfect. Ali was not a superman. 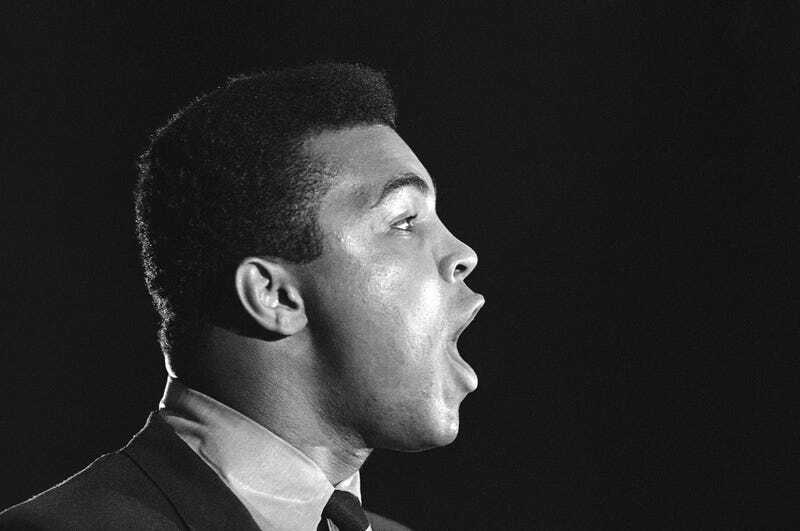 But Ali was relatable, someone in whom everyone could see the version of themselves they wished they could become, whether they were a white establishment businessman clamoring for a ringside seat at Madison Square Garden or an impoverished child in a dilapidated village shouting “Ali, bomaye!” while listening to a fight on an improvised radio. It’s precisely because Ali was so evidently beatable that his will to win meant so much, precisely his imperfection that resonated with what’s deepest inside all of us. Perfection may be awe-inspiring, but it doesn’t inspire devotion. Alex Rodriguez—every bit Ali’s match in terms of pure athletic achievement—spent his professional existence trying to be perfect, to look the part in every way imaginable, to never have a hair out of place or a mismatched handkerchief, to deliver only the most carefully-manicured soundbites, and what was the result? It underscored the difference between him and the rest of us, placing him somewhere in the uncanny valley. Ali lived here, with us. He cared about the issues we care about. He coursed with the same emotions that animate us. He struggled with the same flaws that we all see in ourselves. He was ethereal, untouchable, and irrepressible, and yet at the same time, he was substantive, made of the same bits as all of us; is it any wonder that he achieved such universal adoration, even reverence? He was a reflection of all of us, only greater. With the passing of Muhammad Ali, we’ve lost a sports legend, an icon of the 1960s and 70s, and a hero to millions, if not billions of people around the world. We’ve lost a piece of our history and a piece of our mythology, something we will never be able to fully define and will almost certainly never see again. We’ve lost The Greatest.